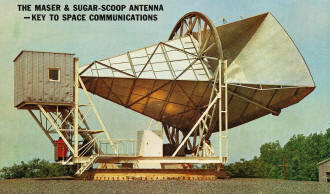 Being the birthday of Dr. Robert W. Wilson, there is no better occasion to post this article about the "sugar-scoop" antenna used by the two Bell Telephone Labs engineers (the other being Dr. Arno A. Penzias) who serendipitously discovered the cosmic microwave background radiation (CMBR) believed to be a signature of "The Big Bang." The pair were investigating an unexplained hiss in the background of the very low noise receiver attached to the antenna. That microwave energy was constant and came from all areas of the sky, regardless of where the antenna was pointed. They eventually deduced that the signature was consistent with the theoretical energy level of the primordial "soup" that was our universe a short time after expansion began. Although this piece was published in 1960, it was not until 1964 that the discovery was made. 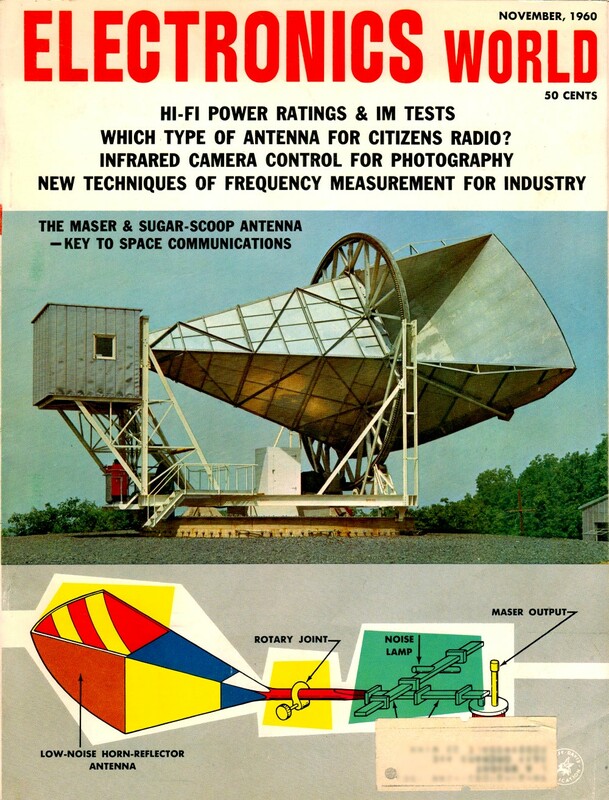 Articles here on RF Cafe which mention the Dr. Robert W. Wilson and Dr. Arno A. Penzias are The Maser & Sugar Scoop Antenna: Receiver for Signals from Space, Bell Telephone Laboratories Project Echo, The Amazing Maser: The Jewel That Conquers Space, Cosmic Radio Signals from Sun and Stars, and Sugar-Scoop Antenna. High on a hill in the New Jersey Highlands near the birthplace of radio astronomy is the unusual-looking antenna that appears on our cover this month. This antenna, shaped like a giant sugar scoop, is Bell Telephone Laboratories' low-noise horn-reflector antenna. Already having been used to receive ultra-weak voice signals from California, after these signals have been bounced off the moon, the antenna is playing a star's role in NASA's project "Echo." In this project, a 100-foot aluminized balloon, launched by rocket, served as a reflector for coast-to-coast radio signals. According to Frederick R. Kappel, President of American Telephone and Telegraph Co., the type of research that is being done by telephone scientists today in space communications is aimed at creating thousands of high-quality voice channels and, ultimately, television channels, that would interconnect all parts of the globe by way of satellites. The unusual shape of the antenna is required not only to obtain very high gain (about 43 db) and a narrow beam width (1 1/4°) but also to eliminate any side or rear lobes from the antenna's directional pattern. Even with large and highly directive parabolic-reflector antennas, some undesired lobes are directed toward the ground and the sky. These produce some noise in a system that cannot be tolerated because of the extremely weak signals. The entire structure, made largely from aluminum, is about 50 feet long and about 35 feet high. The horn opening measures around 20 by 20 feet. The entire assembly can be rotated through 360 degrees on its circular track, and the large upright wheel allows it to be oriented at any vertical angle. The output signals from the horn are applied through a rotary joint and some r.f. plumbing to the ruby maser amplifier located in the small cab at the end of the antenna. The maser maintains the high sensitivity and extremely low noise characteristics that are so essential in working with very weak signals.